Today both the House of Lord and House of Commons approved the Crossrail Bill, which grants the powers needed to build Crossrail, London's new super tube line. The only obstacle now is money. From now on the route, the stations, the buildings to be demolished, and everything else is now set in stone. If they build it at all, it has to be built as set out in the countless bill documents, unless they aquire new powers or push through another Act of Parliament. The only thing I can't see is any requirement for them to build all of it. So no more bickering about how the route should be changed. And no more Astoria. The diagram shows how the tunnels will be dug, taken from this document. Yes, it's missing Woolwich station, but is otherwise correct. The only problem is where the depots are - stopping Farringdon-Abbey Wood from being able to stand on it's own. I thus propose the following phases: Royal Oak-Farringdon, Farringdon-Limmo, Limmo-Abbey Wood (the latter 2 being one phase, opening in segments) and finally the Stratford branch. Doing it this way also helps them realise that 2 eastern branches is a horrible mistake and something else will have to be done with the Shenfield Metro lines (like another tunnel across London) - it won't matter which branch you do first, really, due to both of them being woefully under-supplied by Crossrail. This modular approach gets bits opened quicker, and also allows other bolt ons (say Reading, Hounslow, etc) to be added fairly sharpish as well, due to the success being instantly visible and also not having to worry about adding the cost to a huge scheme that's desperately trying to keep its costs down. Si Hollett, Crossrail is desperately needed for both Stratford and Canary Wharf. They should built it all, and then split it if the capacity won't be enough. Glad this has finally got royal assent. Only a few decades late! IMO this route should be considered Phase 1. Phase 2 should be extensions to Reading, Hounslow and Ebbsfleet. Doubt if they'll ever happen. This initial route will cost so much as it is, without any extra outlay. If the mainline to Bristol and beyond were electrified, as is being mooted at the moment, what woud stop Crosssrail trains extending that far anyway without any special extra expenditure (apart from perhaps a couple of extra trains? Reading station is being remodelled anyway and would be able to take in Xrail trains. Am i missing something jaw-droppingly obvious? sorry - I meant to say "extend as far as Reading"
The Reading question always comes up in Crossrail discussions, the issue is that Reading - London passengers will use the faster HST service. Crossrail is basically an all stations stopper, and the Maidenhead - Reading section had no business case for a frequent service with 10 car trains a la Crossrail. Similar with Hounslow - it's all been looked at and found unnecessary over the last 10 years or so. I think the time has come to stop debating the route really. but surely extending crossrail to reading is like the WCML to Watford junction - either the local use the fast services or you make it it set down / pick up only. that and surely you save the train paths on the slow lines that would still be there for the stopping GWML service (for Twyford), i mean surely not all cross rail services will be going to the extremities, you'll would have turn back facilities part way along? philipb: Nothing really, though you'd have to use Crossrail's own trains as there are platform edge doors and automatic train operation to contend with. But it's the same as asking for trains from Shoeburyness to Weymouth via the District Line. The technical hurdles to that are small but it ain't going to happen. I'm surprised that there is no station for London City Airport - it looks as though the line will go very close. Surely there would be a good business case? I have also read that this will be a "24 hour railway". Does anyone know if that means that there really are plans to operate this railway 24hours a day - or is this just one of those throwaway expressions officials like using but in fact only intend to run the service the equivalent of "tube hours"? SO what are the chances of this getting built now. As there was always a fair chance that it get passed this week before the summer holidays. Now this has happened, Will it get built ? Alan: They're reusing the old North London Line alignment that doesn't go quite close enough to City Airport, and it's presumed won't attract passengers away in any significant number. philipb: I think you or the journalist have misread "24 trains per hour". The draft timetable has normal rail/tube opening hours. trances: The funding agreement isn't signed off yet, but I can't see any reason why it wouldn't be. I think it has a pretty good chance of actually happening, though there may well be delays. This will have semi-fast services, so a Reading service would be good for those in west London, Slough etc... who might work in Reading - a big counter-commuting hot spot! Obviously people travelling from Paddington and above-ground would be better off using a fast service, but from Canary Wharf - perhaps a one-seat ride (sorry for the Americanism) semi-fast on Crossrail might be quicker than changing at Paddington, waiting for a train etc... Or if not quicker, then much simpler and could get some work done. I think they'll do Ealing, Hayes, Slough and Maidenhead. With (maybe Twyford for some) and Reading tagged on, the journey time wouldn't be ridiculous, especially with better than HST acceleration. Also LHR connections at Hayes, better and cheaper than going into London and taking the Express. Mr Thant: the 24 hour railway was on a BBC local news broadcast - which in itself is no guarantee of the truth but normally as good as we get. I am not interested in Crossrail itself being 24 hours - but just as an indicator of how the authorities are currently thinking. If this were to be the case with Crossrail , would it signal getting long term plans for 24 hour services on, say, Thameslink 2000? indicated that the CrossRail hours would be similar to London Underground hours (it mentions 05:45 - 00:30). The Track Access agreement isn't so specific - it only refers to 'service start time' and 'service end time' - so things may have moved on. Re London City Airport. I still find it a strange ommission. The distance from the door of the LCY terminal to the former NLL is perhaps 300 metres. Surely that's less than the distance from the HEX station at Heathrow123 to some of the terminals there? Perhaps the owners of LCY weren't willing to put up any funding and so missed out on a station? re: 24 hours. There's definitely something in one of the reports about Heathrow trains needing to use Paddington High Level late at night/early morning when the Crossrail tunnels aren't available. 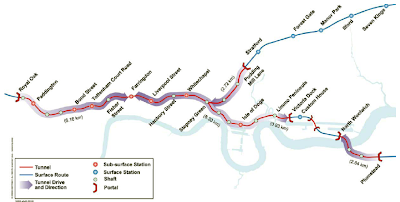 Also Crossrail has no crossovers between the central tunnels, so single line running for a limited overnight service would be a big challenge. Thameslink is already 24 hour. I've no idea if the extra routes will be. re: LCY. It has the DLR right outside the front door and the total passenger volume for both the airport and onto the DLR is very small. There's very little else in the area to serve, so the case for it is marginal at best. Anyone think the "24 hour railway" came about from some journalist misunderstanding the meaning of a 24 trains-per-hour railway? 2) Liverpool Street all stations to Shenfield service. That runs every 10 minutes mid-day, weekday evenings until 21:52 and Saturdays until 21:07. Should give you some idea just how many passengers there already are. The tunnelling priorities should allow the first services to be Shenfield to Farringdon. That will allow other service changes to benefit all Liverpool Street passengers to be delivered whilst the last few months work on the rest of Crossrail is finished. I have two issues with Crossrail 1. 1 - too many stations for this length of line. This should be an express/semi-express service for the long-distance traveller, and SHOULD be bebenefitting travellers from Reading, etc. I would at least like them to explore the possibility of passing tracks at stations so express services can go through, much as they do on the NYC subway. It isn't on Sundays. There is a five hour gap from St Pancras International to Bedford in the early hours. Also, there is a gap of over two hours Mondays - Fridays from St Pancras International to Bedford in the early hours, so not really a 24 hour service then either. The current Crossrail proposal is OK. Crossrail should stop at Westbourne Park (all routes), Limehouse and Plumstead (Abbey Wood branch) whick is not included in the current proposal. There could also be a branch off the North Kent Line at Abbey Wood to a new overground station at Thamesmead or from the site of North Woolwich station under the Thames to a new underground station at Thamesmead. I forgot to add something to the comment above. It was: rather than Maidenhead, there should be Crossrail services to Windsor & Eton Central absorbing into First Great Western services.